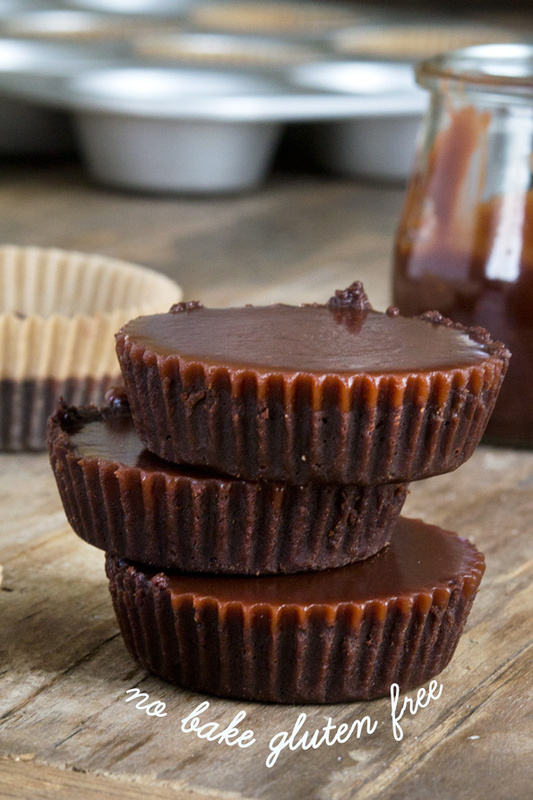 No Bake Gluten Free Cupcakes: Chocolate Caramel | Great gluten free recipes for every occasion. [pinit] Since it’s still summer (still? yes. still), nothing charms like a no bake gluten free treat. And we all like to impress friends and family without breaking a sweat in the kitchen. You know I’m right. 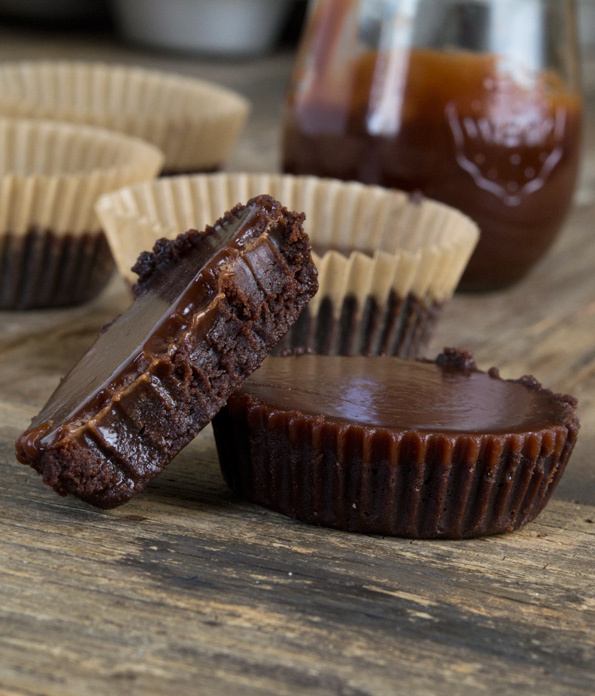 Enter these chocolate caramel gems. They’re not really no bake gluten free cupcakes, but they’re also not really not cupcakes. You make them in a muffin tin. In a cupcake liner. Need I go on? (please don’t make me go on.) You know you’re into cooking sugar when you have the proper motivation (hello? gluten free licorice!). If I may be so bold, chocolate caramel is, indeed, the proper motivation. A word about the crust: with the right balance of crumbs to butter, it becomes almost like a cookie, shaped as you like. So when you’re making, say, a no bake gluten free key lime pie, the crust holds it own without complaint. Here, in these cups, the crust holds the ridges of the greaseproof liners (greaseproof liners are key here, since they don’t stick – I use plain, unbleached liners made by If You Care, and I buy them in the regular grocery store). Use my little juice glass trick (described in detail in the instructions below) to press the crust properly. You’ll have to pour in the filling while it’s still hot so it doesn’t set before it’s in place, but you’re made of tough stuff. These really are fun to make. It’s amazing what sugar can do when you heat it. And it’s amazing what it can do for everyone’s mood when you show up to the next summer potluck carrying a plate of these little gems. Watch them line up for just a bittersweet chocolate taste! 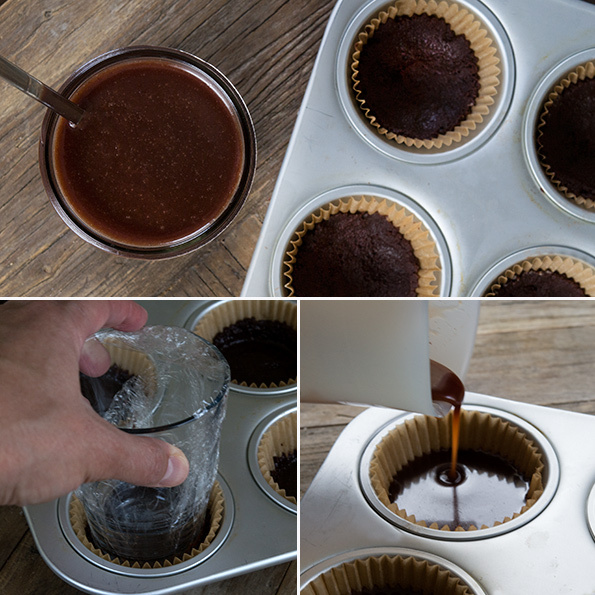 Line a standard 12-cup muffin tin with greaseproof liners. Set the pan aside. Make the crust. Place the butter and chocolate in a small, heat-safe bowl over a pot of simmering water (making sure the bowl does not touch the water, and the water does not boil). Stir until almost melted. Remove from the heat and continue to stir until both the butter and the chocolate are melted and smooth. In a large bowl, mix the cookie crumbs with the melted butter and chocolate until well-combined. Divide the mixture among the muffin liners in the tin, and press into the bottom. Cover the bottom of a juice glass with plastic wrap, and press it into the bottom center of each muffin liner to compress the cookie crumb mixture and press it up the sides of the liners a bit. Place the muffin tin in the freezer until the crusts are firm (at least 10 minutes, but longer is fine). Make the filling. Place the sugar, water and cream of tartar in a medium-size, heavy-bottom saucepan and whisk to combine. Cook, undisturbed, over medium-high heat until the sugar begins to turn amber-colored around the edges and reaches about 300°F. Remove the saucepan from the heat, stir to prevent the sugar from burning, and add the heavy cream. The mixture will bubble up quite a lot. Stir until the bubbling subsides. The sugar may seize up, but it will melt again. Add the chopped butter and chocolate, and stir to combine. Return the saucepan to the heat and cook undisturbed, over medium-high heat, until the mixture reaches 245°F. Remove from the heat and whisk in the vanilla. Pour the mixture immediately into the muffin cups, on top of the cookie crumb crust, about 3/8-inch above the crusts. Allow the cups to sit at room temperature until the filling is set (about 1 hour). 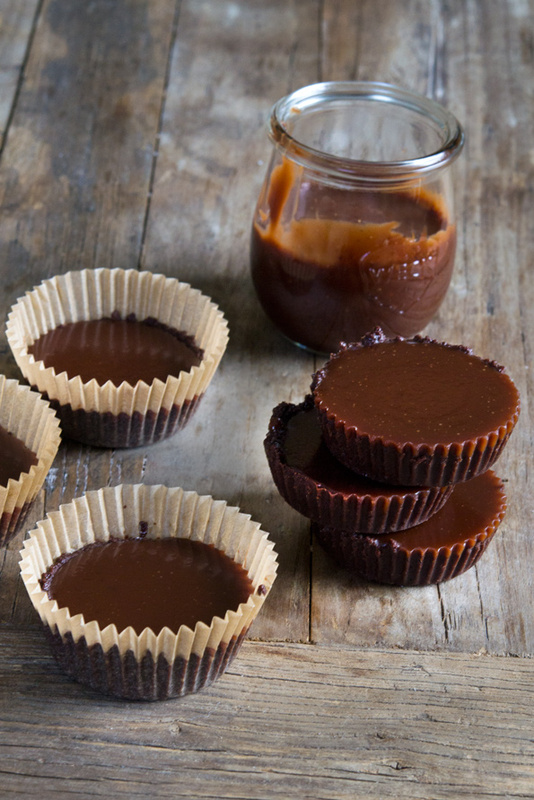 Store any leftover chocolate caramel in a heat-safe container. It will become firm, but can be softened by either placing in the microwave for 30 seconds, or in a simmering pot of water until smooth. Question, I am also dairy-free, do you think coconut milk in a can or coconut cream would substitute the cream or not? I would love to try!!! Or maybe I can find dairy-free caramel somewhere, hmm. O man, these look holy-moly fantastic! Oh myyy!! This does look scrumdiddlyumptious!!! Thank you oh so much!